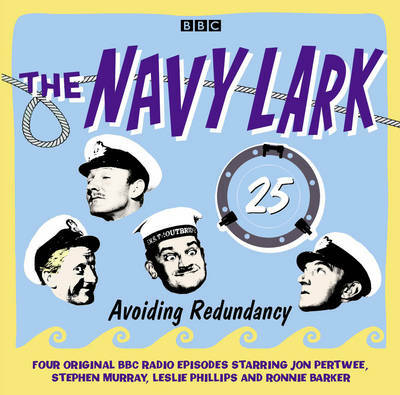 Jon Pertwee, Leslie Phillips, Stephen Murray and Ronnie Barker star in these four hilarious radio episodes. 'Farewell to HMS Varsity'/''Drifting Through' (9 October 1966): Lt. Murray's first command, the mine sweeper HMS Varsity, is being towed on its final trip to the breakers' yard - along with some unsuspecting passengers... 'The Army Lark'/''Blowing Themselves Up' (16 October 1966): The navy undertakes a combined exercise with the army - a nuisance raid on the coast of Belgium - and it's Troutbridge's duty to take an army platoon so they can detonate explosives on the beach. Naturally, Phillips has trouble finding Belgium. 'Pertwee's Enlistment Expires'/'Avoiding Redundancy' (1 December 1968): Pertwee has every right to be suspicious when he is summoned to Captain Povey's office and offered a cigar: he has forgotten to re-enlist in the senior service. Will he really be discharged? 'The POW Escape Exercise'/'Escaping Back Into' (2 April 1972): Pertwee, Phillips and Murray are transported to a secret location in the back of a military truck as part of a new naval initiative. Their mission? To escape from a POW camp under the simulation of wartime conditions... With Richard Caldicot, Heather Chasen, Tenniel Evans and Michael Bates. 2 CDs. 1 hr 48 mins.